Comics creators from 7000 BC will will be on hand throughout the event to answer questions and give guidance. We’ll provide some art supplies, or bring your own. We’ll even help you print, fold and staple your mini-comics as you complete them. Bring your papers, pens, and imaginations! 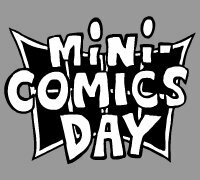 1:00-2:00 pm – For those who would like some guidance, a short lesson on making mini-comics and comics in general will be presented by 7000 BC. 1:00-5:00 pm – Make your minis! Comics, mini-comics, and books by 7000 BC creators will also be available. Sponsored by Page One Books, and 7000 BC – independent comics from New Mexico!